As Spring Moves in, Fishing is Up and Down! It’s kinda funny how those that are here in Puerto Vallarta during High Season assume this is the best time of the year for fishing here in Puerto Vallarta. 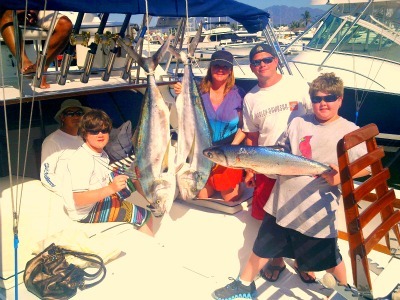 While there is never a bad time to go fishing in Puerto Vallarta (PV). But in fact it is the slowest time for fishing which means the average fish to be caught will be between 15 to 50 pounds. Now if you’re from a place where the fishing is considerably less sizeable, then you’ll have a great time on the water. If you’re a person from a place where you´re used to smaller fresh water fish, then you’ll have great time fishing in the Bay of Banderas. If you are like a few in PV and a fish less than 100 pound won’t grab your interest, then maybe you should wait another month or two before you consider heading out fishing. But be warned, anything can happen at any time, especially at El Banco. So stay tuned as conditions change… You’re best source of information for what is happening on the docks in PV is still this article and my blog….. The big story this week is the same as it was last week, The Marietta Islands are up one day and down the next. The story of fishing in this area is good and bad. This past week I have sent boats out to see them come in with Rooster fish in the 44 inch range and other larger fish, then the next day come in with nothing. Fishing is fishing we all know that and there is always the chance you will come in with nothing, even with the best captain and best equipped boat. That is why it is important to keep track of the bite times and the bait they are or aren´t taking. The whole game is a moving target where experience and equipment in the right combination will pay off if the fish gods allow it. Those who were up to the challenge this week saw some great pay-offs with large Roosters in the 50 lb range, Snappers in the 35 lb range including Cubera Snappers about the same size. We’ve seen milk fish around the reef which are kinda rare here, but great fighters and can be sizeable at 40lbs. There are also a couple of other fish I can´t even tell you their name, have not seen them here at the islands before, but they fight like demons (see picture). Live bait works as will lures. Make sure you have some basic lures, diamond jigs, Rapallas, Poppers and some smaller jigs with skirts of Orange, Yellow, Blue and purple in color will do the job. With few boats heading out to El Banco and Corbeteña, there is little to report. But Sailfish have been sighted but not boated as yet as far as I know. Now that we’ve come into April, it is just a matter of time now before we see this exciting billfish invade the area. Warmer water conditions have drawn them back and other species will follow shortly. Dorado may start moving into the area, but it was July last year before we had the chance to see any that were sizeable. For now, other areas are a better bang for your fuel buck. Sayulita is still strong, very strong with Rooster Fish in the larger size ranges around the structure. Diamond Jigs and poppers are working well. But there have been long liners out there screwing things up and these guys can be aggressive if you get close to their gill nets or long lines. But this is nothing new. The Tres Maria Islands have lost their recent popularity as the prison officials have decided to get back to the hard line of enforcing boundary distances. Remember these are prisoners and boats just a short distance off the islands represent a possible threat of escape from the island on conviently placed fishing boats. This area has always been here, yet those who have been around for a while know why we don´t go there. It´s those Cowboy types that want to push the envelope and be reckless with others boats, money and reputation. Be smart and wait for summer when the Yellowfin are at El Banco. This area around the Tres Maria islands is not worth risking your boat and freedom amigos. Just because a few with big ideas are getting fish, it doesn´t mean you have to jump off the cliff with them! Again, this is the reason the old timers shake their heads at those Cowboys as their boats get confiscated. The bay is still full of Sierra Mackerals and are in different size ranges. If you are near the shore, they are naturally small. Further out, they´re larger and sometimes in the 30 lb range. Large for a Sierra Mackerals! Needle fish, Jack Crevalls, and a series of smaller gamefish are out there. Yet where can be the question. If you hit fish in one place, they probably won´t be there the next day as is the case many times. 3/28/11 UpDate: The currents are acting up again and the water has gotten dirty again as is normal for this time of the year. The Marietta Islands are being patrolled by the navy now and there have been some tickets written, so keep your distance. Snappers have invade El Morro and the Rooster fish in the safe area around the reefs are getting bigger by the day, largest one so far this week is 60 inches and that is five feet long! Water temperatures still hovering in the mid 70’s with plenty of bait in the water. It´s just a matter of time when it all explodes now with summer on its way. Stay tuned for more updates as they´re warranted. As a legitimate business owner, it drives me crazy to have to compete with those who illegally compete with my fishing business and I have never gone after these guys. The only thing they make money on is tours, so Master Baiter’s is now going into the tour business and we will get you the absolute best prices you can get on Vallarta Adventure tours! If you go fishing with us, we will get you all the tours you want with discounts that Vallarta Adventures won’t let me advertise. Larger groups will be very happy with the money you´ll save. Lets face it, fishing and tours are expensive. With this new program, you might be able to save enough money to pay for your fishing trip, of course this depends on which boat, but our intentions are clear. We want to make sure you have fun, don´t get ripped off and become your source for information, fishing, tours or Unique Products. So there you are, I have declared a price war on all Hotel or Timeshare / Vacation Ownership agents / promoters! Just stay away from those people, they don´t care about you, they just want your money. Don´t do anything you wouldn´t do at home and you´ll be fine! This entry was posted in Beach Vacations, Big Game Fishing, Deep Sea Fishing, Family Vacations, Fishing, Fishing Articles, Fishing for Sailfish Fishing, Fishing in Mexico, Fishing Reports Puerto Vallarta, Marina Vallarta, Marlin fishing, Marlin Fishing in Hawaii, Marlin Fishing PV, Mexico, Mexico fishing, Mexico Pirates, Mexico Safety, Mexico Safety Concerns, Mexico Tourism, Pictures Fish, Porto Vayarta, Porto Viarta, Puerta Vallarta, puerta viarta, Puerto Vallarta, Puerto Vallarta Sportfishing, Puerto Vallarta tourism guide, Puerto Vallartra Fishing, Puerto Viarta, Restaurants in Puerto Vallarta, Safe Travel in Mexico, Sport fishing, Sportfishing in Puerto Vallarta, Sportfishing Puerto Vallarta, Sports Travel, Travel, Travel Sports, Uncategorized, Yacht Rental, Yellowfin Tuna Fishing and tagged Big Game Fishing, Bloody Decks Puerto Vallarta, Cabo Sportfishing, charters, Deep Sea Fishing, Fishing, Fishing Puerto Vallarta, Fishing Tours in Puerto Vallarta, Marlin, Marlin fishing, Mexico, Puerta Viarta, Puerto Vallarta, Puerto Vallarta Bloody Decks, Puerto Vallarta Fishing Reports, Puerto Vallarta Tours, Sailfish, Sportfishing, Sportfishing in Cabo San Lucas, Tours in Puerto Vallarta, Travel, Tuna fishing, Yellowfin tuna, Yellowfin Tuna Fishing. Bookmark the permalink. Waiting for Summer, Snappers at El Morro Big Time!